Atomic Absorption Spectroscopy requires the conversion of the sample to gaseous atoms, which absorb radiation. In AAS the sample is most commonly introduced as a solution. The solution is drawn in through a small tube and taken to the nebulizer where the solution is broken up into a fine mist (this is similar to an aerosol can). The fine mist is carried to the atomizer, such as a flame, by a carrier gas. When the mist reaches the flame, the intense heat breaks up the sample into its individual atoms. This final process is called atomization. There are two main types of atomizers: discrete and continuous. Continuous atomizers introduce the analyte in a steady manner whereas discrete atomizers introduce the analyte discontinuously. The most common continuous atomizer in AAS is a flame, and the most common discrete atomizer is the electrothermal atomizer. Sample atomization limits the accuracy, precision, and limit of detection of the analytical instrument. The purpose of the atomization step is to convert the analyte to a reproducible amount of gaseous atoms that appropriately represents the sample. Diagram describing the process of atomization for continuous atomizers. During electrothermal atomization, a sample goes through three phases to achieve atomization. First, the sample is dried at a low temperature. 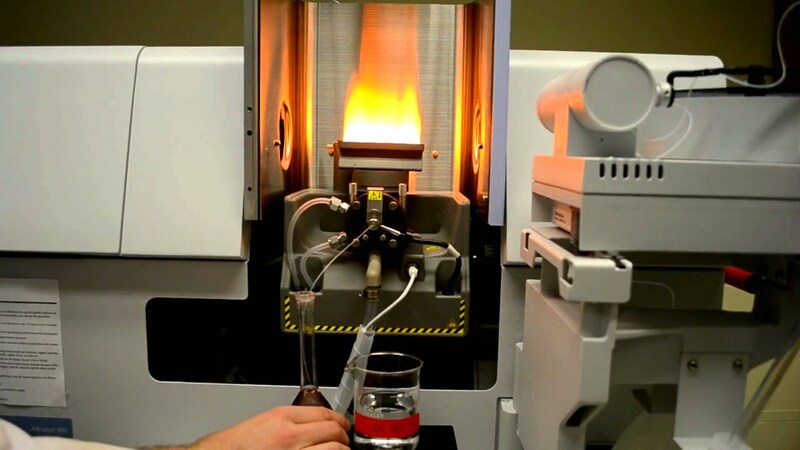 Then the sample is ashed in a graphite furnace (discussed below), followed by a rapid temperature increase within the furnace where the sample becomes a vapor containing atoms from the sample. Absorption is measured above the heated surface where the sample was atomized. A graphite furnace is made up of a graphite tube open at both ends with a hole in the center for sample introduction. The tube is encased within graphite electrical contacts at both ends that serve to heat the sample. A supply of water is used to keep the graphite furnace cool. An external stream of inert gas flows around the tube to prevent outside air from entering the atomization environment. Outside air can consume and destroy the tube. An internal stream of inert gas flows through the tube, carrying away vapors from the sample matrix. Electrothermal atomizers provide enhanced sensitivity because samples are atomized quickly and have a longer residence time compared to flame AAS systems, which means more of the sample is analyzed at once. This method can also be used for quantitative determinations based on signal peak height and area. 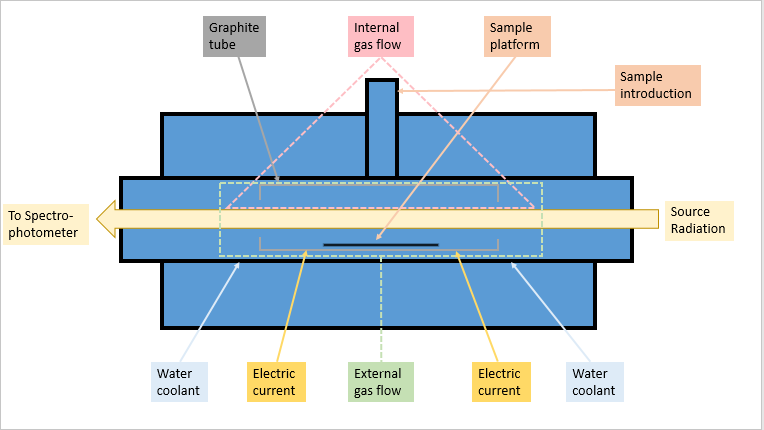 Electrothermal atomization also offers the advantage of smaller sample size and reduced spectral interferences because of the high temperature of the graphite furnace. However, electrothermal atomizers have disadvantages including slow measurement time because of the heating and cooling required of the system and a limited analytical range. Additionally, analyte and matrix diffuse into the graphite tube, and over time, the tube needs replacing, increasing maintenance and cost associated with electrothermal atomization. For GFAA (gas furnace atomic absorption) the range is between 100 ppb to 1ppb. This is because the matrix, even though removed, still plays a role in the scale of detection. After being nebulized by gaseous oxidant and mixed with fuel, the sample is carried into a flame where the heat allows atomization to occur. Once the sample reaches the flame, three more steps occur, desolvation, volatilization, and dissociation. First a molecular aerosol is produced when the solvent evaporates (desolvation), then the aerosol is formed into gaseous molecules (volatilization) and finally the molecules dissociate and produces atomic gas (dissociation). During this process cations and electrons can also be formed when the atomic gas is ionized. The table shown lists the most common fuels and oxidants used to produce flames for AAS. A mixture of different oxidants and fuels can be used to achieve a specific temperature range. Because dissociation and breaking molecules down to atoms is easier with more heat present, oxygen is the most common oxidant used in flame atomization. To control the flow rate of an oxidant and fuel a rotameter is used, this is a vertically placed tapered tube. With the smallest end placed down, a float which is located inside the tube determines the flow rate. Close control is vital because the flame is very unstable outside of its specific flow rate range. If the flow rate is not greater than the burning velocity indicated, the flame will experience flashback and propagate back to the burner. If the flow rate is too high, the flame will blow off the burner. When the flow rate and burning velocity are equal, the flame is stable. Usually the flame consists of an excess of fuel to prevent oxides forming with the molecules of the sample. All locations of a flame are not equal in temperature, and are not equal in fuel to oxidant ratio. 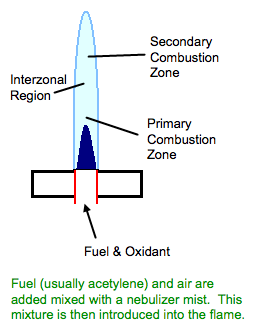 The three main zones of a flame include the primary combustion zone, secondary combustion zone, and the interzonal region. The interzonal region is prevalent in free atoms and is the hottest area of the flame. It is therefore the region used for spectroscopic analysis. The flame usually rises about 5 cm above the burner tip, with 2.5cm being the max temperature point. The portion of the flame used for AAS is specific as to what element is being analyzed. Due to the formation of oxides, different elements achieve max absorbance at different distances (cm) above the burner. Flame atomic atomization is the most reproducible of all the liquid- sample introductions, however it has many disadvantages. Oxides are easily formed which leads to a reduced absorbance of samples, and flame atomization has a lower sensitivity than electrothermal atomization. Samples could be drained as waste and therefore have a low residence time, leading to low efficiency. Another disadvantage of flame atomic atomization is the flame fluctuations which can affect the absorbance of samples. A variety of means are used to create the vapor of atoms from the sample that will be analyzed by the AAS. In addition to the methods previously discussed, glow-discharge atomization, hydride atomization, and cold-vapor atomization are techniques that can be very useful for AAS. In a general glow-discharge atomization system, the sample is placed on a cathode. Argon gas is ionized by an applied voltage on the cell, causing the argon ions to accelerate to the cathode where they interact with the sample and eject atoms. This process is called sputtering, the ejection of atoms from a sample as a result of bombardment by energetic species. Samples must either have conducting qualities or be mixed with conducting materials like graphite or copper. The sputtered atoms are then introduced to the path of radiation for analysis by a vacuum; this is so outside air will not be analyzed only the analyte of interest will be analyzed. 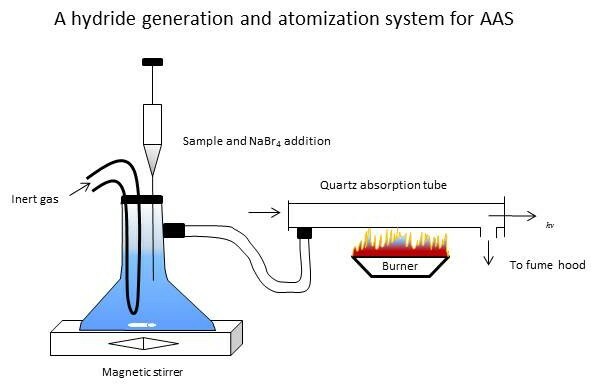 This atomization technique can be used in conjunction with a flame AAS system, and can be used for bulk analysis and depth profiling of solids. In a hydride generating atomizer, samples are typically diluted and acidified before being mixed with a hydride source such as sodium borohyrdide. A volatile hydride-containing the sample is generated and carried to the atomization chamber by an inert gas. During the atomization process, the sample is freed into atoms by heat, releasing the sample from the hydride compound. This can be done in a flame or furnace environment. Hydride generators are generally used for determination of heavy metals and other elements, including lead, arsenic, tin, selenium, and bismuth. This method is useful for these elements because of its increased detection limit. Cold-vapor atomization is only used in the determination of mercury because mercury doesn’t atomize well in a flame or furnace. In this technique, mercury is acidified and reduced and then swept through by a stream of inert gas. Absorption of this gas is then determined.